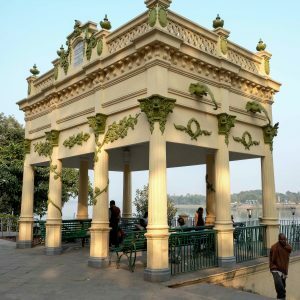 The gardens on the river front, Kolkata, were founded in 1787 by Colonel Robert Kyd, an army officer of the British East India Company, primarily for the purpose of identifying new plants of commercial value, such as teak, and growing spices for trade. The biggest landmark, the Great Banyan is said to be over 250 years old. With a total collection of over 12,000 specimens spread over 109 hectares, the Botanic Garden serves as the lungs for the city. 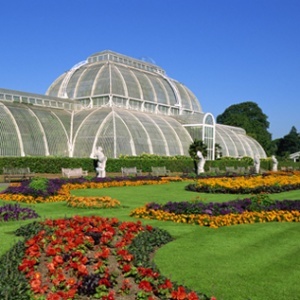 Kew Gardens is home to the world’s largest collection of living plants and has over seven million preserved plant specimens for research. 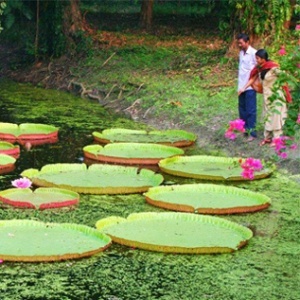 During the British presence in India it is known that many species were shipped back from Kolkata to Kew. Burrabazar is a neighbourhood that has been at the forefront of Kolkata’s changing society for many years and is recognised to host the widest variety of cultures and communities living side by side; including Bengali, Chinese, Armenian, Jewish, Portuguese and many others. This area used to be a huge trade centre attracting tradesmen from other parts of India and the world. 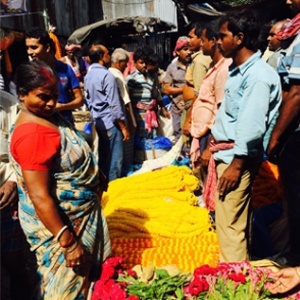 Even today, the bustling and extensive market here is a thriving hub of local life and culture. 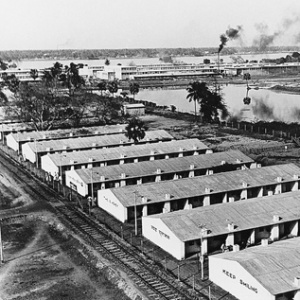 In 1772 the British built a large army barracks in Barrackpore which became a centre for military and administrative command until two large rebellions took place in 1824 and 1857. Across the river the Danish settlement of Serampore was another hub during the Bengali Renaissance and is home the oldest educational institue in the country, Serampore College. 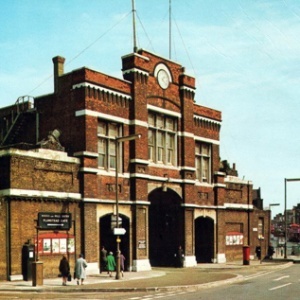 With landmarks such as the Royal Navy College, Royal Arsenal, Artillery Barracks and the Cutty Sark both places are known for their martitime and military histories. With such close proximity to the Thames, the were prime locations for the training of soldiers, marines and sailors. Greenwhich Mean Time is marked from the observatory here. 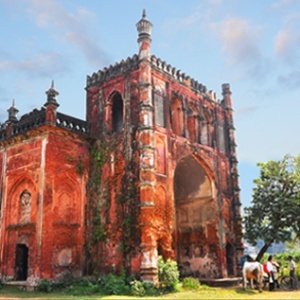 Murshidabad was once the Mughal capital of Bengal. For years it was the seat of power for the Nawabs with their palaces, mosques, tombs, and gardens and after the conquest there was a strong British influence in the area. 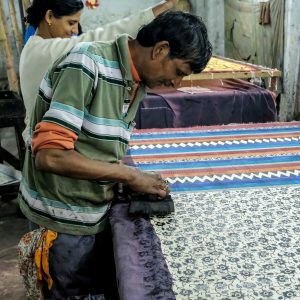 Murshidabad was famous for it’s fine hand-woven silk which we are proud to be using today in the making of the 20 scrolls. 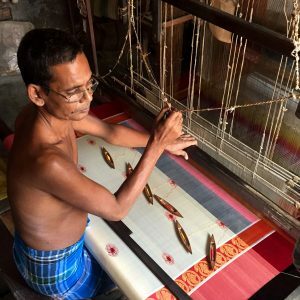 There are many weaver clusters (tanti para) where several weavers work on beautiful sarees with intricate designs. Its most iconic landmark, the Hazarduari Palace (Palace with 1000 doors) attracts thousands of visitors every year. 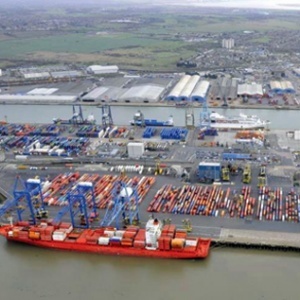 Its geographical situation has given Gravesend strategic importance throughout the maritime and communications history of South East England. A Thames Gateway commuter town, it maintains strong links with the River Thames. 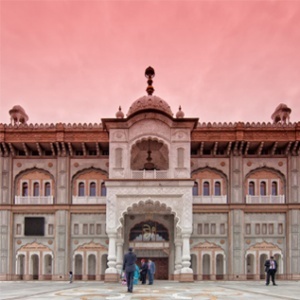 The beautiful Sikh Gurdwara Temple completed in 2010 is one of the largest in the UK. A former French colony, Chandernagore was the main centre for European commerce in Bengal and still has a very European feel within its architecture. Jute is widely grown across the local area and ferried down stream to the mills here before heading to factories in Kolkata. Along this stretch of the river is the Hooghly Imambara, Antpur Temple and Sacred Heart Church. Jorasanko is a neighbourhood in north Kolkata that was home to various distinguished families including the Tagores. The family contributed substantially in the fields of business, social and religious reformation, literature, art and music. The nearby area of Kumortuli is known as a creative hub full of sculptors, painters and potters. 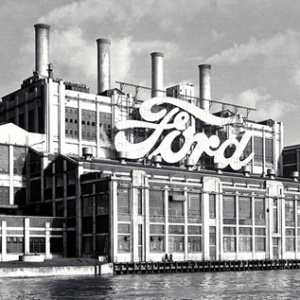 Purfleet is a town just outside the Greater London border that has a mixed history of industry and agriculture. 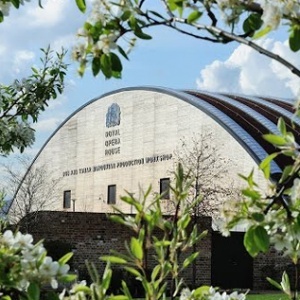 In 2006 a project began to regenerate the High House site into a new hub for the creatives industries that now hosts the ROH production workshops, CCSkills, Acme Artist Studios and Kinetika. Howrah is an industrial city that twins Kolkata on the west bank of the Hooghly. Howrah Station serves as a terminal for two major railway zones of India and is an important hub for commuters. Virtually all means of transport can be seen on the streets in Howrah. The cantilever Howrah Bridge was completed in 1942 to improve connections across the river. 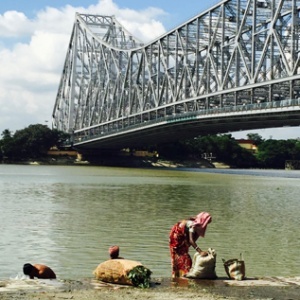 To ease the pressure on this bridge, a second bridge was built across the Hooghly to connect Kolkata and Howrah. This cable stayed bridge is the longest of its kind in India. 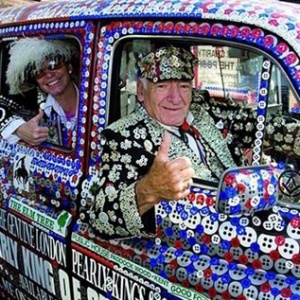 Dartford became a market town in medieval times but it is now mainly a commuter town for Greater London, that has a long history of religious, industrial and cultural importance. 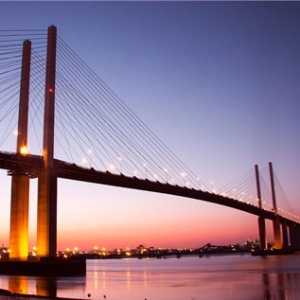 Dartford is a key rail hub and the QE2 Bridge was completed in 1991 as a vital crossing of the river. 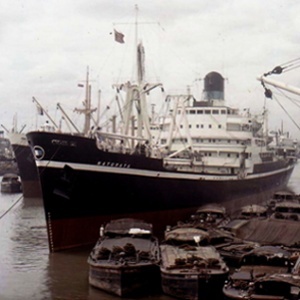 The Port of Kolkata is the oldest operating port in India, and was constructed by the British East India Company from 1870. Kidderpore is still a working dock housing 3 large dry docks for repairs and miles of storage warehouses. Almost all tea that is exported from West Bengal passes through Kidderpore. Batanagar was established from 1934 to start the first shoe factory in India by Czechoslovak industrialist Tomas Bata. 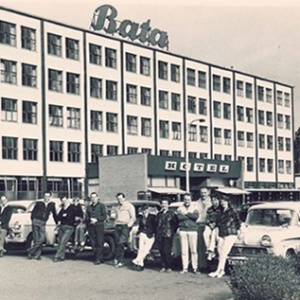 Still in production today, most of the factory’s employees still live in the surrounding area of the specially built ‘Bata-ville’. Batanagar has been home to several leading footballers and this is arguably the favourite sport of the children in that area, most of whom study at the local Bata school. Its location next to the river and its proximity to Kolkata has attracted real estate developers to build a new township at Batanagar. This place is named after the famous 18 C. king, Raja Krishnachandra who lived in this region and was responsible for the growth of creative arts and crafts which got acclamation from the entire state of West Bengal. 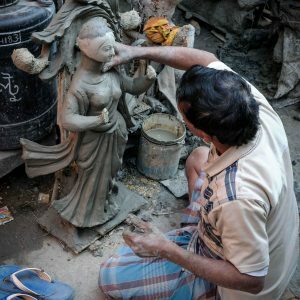 Today it is still filled with talented sculptors and clay doll makers who make puja idols and other religious icons. Krishnanagar clay dolls are unique in their realism and the quality of their finish and have been part of several international exhibitions. 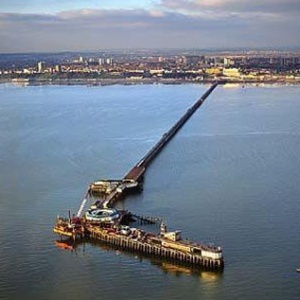 Southend is a seaside resort town that marks the point where the Thames Estuary joins the North Sea. It’s famous pleasure pier is the longest in the world at 1.34 Miles. The area attracts holiday makers but is also known as a haven for artists. The Hindu community here holds one of the biggest Ganesh Puja celebrations outside of India.